Fifty years ago in the foothills of the Cascade Mountains, 451 votes were cast in favor of the organization of Whatcom County Water District No. 10. Shortly thereafter, on November 21, 1968, the Whatcom County Board of Commissioners formally approved its adoption. Half a century later, Water District No. 10’s successor, the Lake Whatcom Water & Sewer District, provides quality drinking water and wastewater services to a population of approximately 11,000 people. The District serves an 18 square mile area encompassing Lake Whatcom. This unique and complex service area includes Geneva, Sudden Valley, and the North Shore of Lake Whatcom. A lot has changed since 1968, the District’s Board of Commissioners has grown from three to five members, full-time staff has more than doubled, and the District now operates over 71 miles of water transmission and distribution lines delivering over a million gallons of water every day and over 75 miles of sewer collection and conveyance lines. One thing that hasn’t changed with time is the District’s mission to provide the best possible water and sewer services to its customers in a way that contributes to protecting Lake Whatcom’s water quality. The District is committed to providing safe and reliable drinking water and sewage collection to its customers. 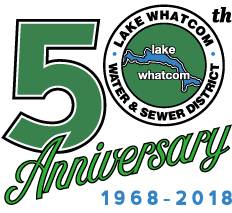 When the District was formed, its primary purpose was to provide sewer service to the many homes on septic systems around Lake Whatcom. The biggest expansions occurred with the construction of Sudden Valley, and new developments on the North Shore of Lake Whatcom. In 1977, the District assumed ownership of the Sudden Valley Water Company and the Geneva Water Company, and began providing water directly to many of its current customers in those areas. Water is a precious resource, and the District has a sharp focus on protection and stewardship of the Lake Whatcom Watershed. Lake Whatcom is fed by 24 streams and a diversion dam from the Middle Fork of the Nooksack River, and provides drinking water for residents of the City of Bellingham as well as customers of the District. An increased investment by the District in infrastructure improvements and preventative maintenance have led to a great reduction in sewage releases. With the number of spills and overflows greatly decreased, the Board of Commissioners has been able to shift its focus to protecting the natural resources within the Lake Whatcom watershed both through efforts of the District and through cooperative partnerships with other community and governmental organizations. Just prior to its 50th Anniversary, the District welcomed new General Manager Justin Clary, and new Operations & Maintenance Manager Brent Winters. Heading into 2019 and the years beyond, the District looks forward to continuing to provide quality services to its customers while preserving Lake Whatcom. With over $9.3 million projected in capital improvement projects scheduled over the next six years, the District remains committed to providing efficient and effective services to the Lake Whatcom community.